Today is a spiritual retreat day for the Papua New Guinea branch. As I spent time this morning in reflection and prayer, I found myself thinking about joy. Have you ever had one of those days when you just feel tired out by life, instead of full of it? When you just feel dry? I have had a few of those lately, and I’ve been wondering when joy escaped me and where it is hiding. Being a word-loving person, I decided to look up “joy” in the dictionary. According to Webster, joy is “to experience great pleasure or delight; the emotion evoked by... the prospect of possessing what one desires.” The first part of that definition is pretty straightforward, but the second half got me thinking. Perhaps when I am not feeling joyful, I should pay attention to what I have set my heart on. If what I am desiring is God, there is no reason not to be joyful, for He is already mine, and has promised that when I seek Him, I shall find him. But when I find that my life is joyless, it’s probably because I have set my heart on something inferior, hoping that it will make me happy. Anyway, those are the things that I was pondering this morning. To go along with this thought, I was inspired to go and take a photo of the passion fruit vine in my back yard, because to me it was a good picture of joy. Joy, after all, is a fruit of the Spirit, right? 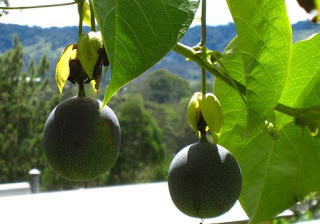 And Brian and I are currently quite addicted to passion fruit, and when I look at the fruit and wait for it to ripen, I am filled with great delight at the prospect of eating it!